First wet lab work I've done in more than a month. 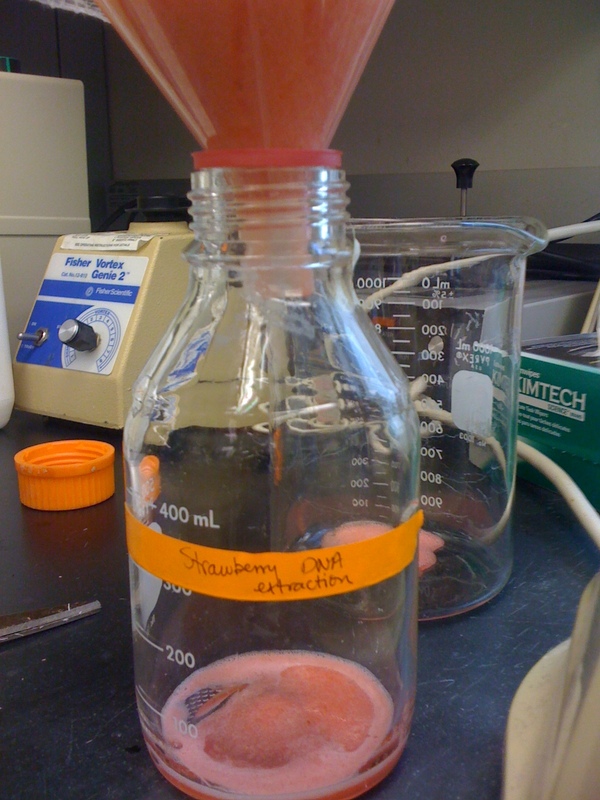 Also how often do you see a bottle actually LABELLED as "Strawberry DNA extraction"? It’s actually quite easy* to extract visible quantities of DNA from fruits and vegetables using nothing less common than dish soap and rubbing alcohol. For our class we chose strawberries, but I also heard of people using kiwis and bananas to great success. Of course it takes a mere second for someone to say “I don’t eat food with genes in it” and 15 minutes to prove them wrong by extracting DNA from an (organically grown) banana, but that imbalance between the time and effort it takes to repeat piece of false information and the time it takes to refute that same misinformation isn’t going to change. It is something anyone in the habit of going up against misconceptions with nothing but demonstrable facts on their side has to get used to. The demonstration itself went pretty smoothly. Unfortunately, since it’s a hundred student lecture, we had to do most of the preparation beforehand, so I don’t think most of them realized just how easy DNA extractions can be. *Note that this recipe calls for the use of meat tenderizer to break down some of the remaining proteins in the solution before extracting DNA, and points out that pineapple juice will make an acceptable alternative (as it also contains enzymes that break down proteins.) I mention this only to reiterate my point, as if you hadn’t heard it before, that pineapples are one of the most awesome fruits known to mankind. Nice! 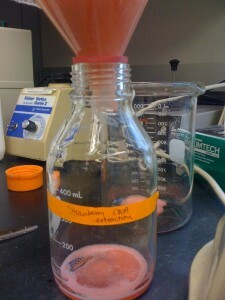 I remember extracting DNA from an onion in high school biology class. I managed to miss out on DNA extractions in school, but I remember the first time I saw it come out of solution during my first week working in a biology lab. Very cool feeling. I agree, pineapples rock! Now you’ve got me thinking about grilled pineapples, my personal fav. I hadn’t had grilled pineapples before I moved to California, but I must admit, they’re winning me over. will this work if i want to extract protein (enzyme) & get the mixture of juice+detergent (solution) instead of the clumpy thingy?